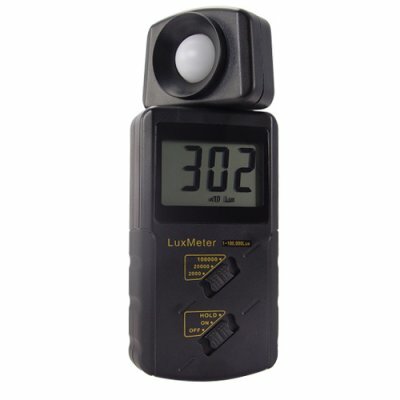 Successfully Added Digital Light Meter - LuxMeter x100 to your Shopping Cart. The CVHM-G93 LuxMeter x100 is a new high sensitivity digital light meter that gives you the ability to accurately measure high or low levels of light from 1 - 100,000 lux. Its easy to use with a simple slide-locking function switch, has a swivel sensor head, and is portable sized for easier carrying in the field. With the perfect combination of product features and ease of use, this digital light meter brings accurate light measurement to everyone who needs it, and finally provides it at a factory direct price! If you have been putting off getting a good light meter because it cost too much or was too difficult to use, now you finally have one you can be happy with - the CVHM-G93 LuxMeter x100. In stock in our warehouse, order yours today and be taking in-field light measurements next week! Add it to your cart right now to make your job a little easier and more rewarding.